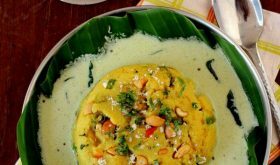 Mamidikaya pappu aka Mango dal is Andhra’s treasured classic pappu kura (dal). The recipe featured is a family favorite and its as simple as it can possibly be. Mango and tuvar dal are a magical combination. They are lovely on their own, but together, they are a match made in heaven. The tang of the mangoes bolsters the earthiness of the lentils and the garlic infused spiced seasoning lends a subtle savory flavor. Refreshing and lip-smackingly good! 1 In a pressure cooker, place dal, mango pieces, onions, green chillis, ginger and turmeric pwd. Add 1 1/2 to 2 cups of water and pressure cook upto 3 whistles. If cooking over stove top, cook till the dal and mango pieces are almost cooked. 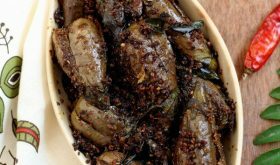 2 Heat oil in a heavy bottomed vessel, add mustard seeds and as they splutter, add cumin seeds, garlic, red chillis and curry leaves and stir fry for half a minute. 3 Add this to the pressure cooked dal along with salt and combine. Cook on slow to medium flame for 8-10 mts without lid or till you get the consistency of your choice. 4 Serve with white rice, a stir fry dish (vepudu) and appadam. You can alternately, cook the mango pieces separately in a cup of water and add the mango pieces with the left over water to the pressure cooked dal. I have been following your website for a long time , this is a Perfect recipe to Welcome Summer! Thanks Sailu. Sounds very interesting. I can’t wait to try it. I have a Mango that is almost too ripe, will that work ok or should I get one that is less ripe? You need a raw mango, Michelle. great to see you back..I keep checking everyday for any updates. I am going to try this right away! This was yummm… i tried it today morning. Great result. Thanks a ton. Mango and Dal! Now that’s an interesting combination. Very nice website. I have tried a lot of dishes and they are perfect. 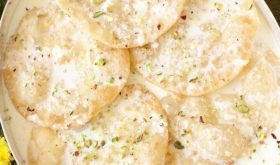 We make this mamidikaya pappu with a variation that is divine. Dont use ginger and garlic in the recipe. Instead, in the tempering add a big pinch of HING. Try it and you would be amazed at the taste and flavor. You are absolutely right. 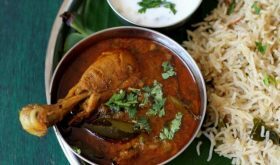 I prepare this variation too using asafoetida sans the garlic and ginger. i have some frozen green mango in the fridge. thanks for another wonderful recipe, dear sailu. A question from a non-Indian who LOVES Indian dals: are you using raw ripe mango (sweeet mango) or raw UNripe mango (sour mango)? I would think it would make a difference, eh? I am anticipating that it is unripe mango but i would like to know for sure before I make this. Sounds divine and easy for a disabled cook to make! Hoping you see this late question and respond, thanks, QDrake…LOVE this site for years now! Glad to note you love my blog and Indian dals. 🙂 Yes, you are right, we raw UNripe mango which is sour to make this dal. It is a favorite in our home. Thanks for seeing such a late comment and answering! I was reasonably sure it was unripe(sour) mango, but I always like to check with the source of the recipe when I have such doubts. There are so many lovely recipes here, many of which are fairly easy for a disabled cook. 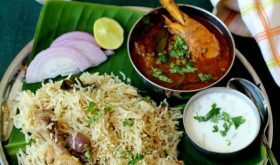 Every so often I just crave the flavors of India even though I am American born. My mom taught me and my siblings to appreciate and enjoy many cuisines from around the world, and I bless her for doing so. One last question – if I cannot find unripe mango (labeled as such), can I just buy a hard mango from the market and grate it or chop it? Is there any other possible substitute for the sour mango? I would appreciate to know. Thanks Sailu for sharing so many wonderful things with the netizens of the world! Yes, a hard mango can be grated or chopped. Whatever suits you. I’m afraid there is no substitute for sour mango. I just had a thought… If I use amchur powder for the sourness, could I use mirliton(chayote squash, you may know as chow-chow) for the vegetable, to add the texture? What do you think? Amchur will yield a slightly different flavor and will be no where close to the original flavor of fresh raw unripe mango. Having said that, you could use amchur powder to add a note of sourness to vegetables like chow chow. But the recipe is a bit confusing for me as my grand mom says tur dal won’t cook properly in the pressure cooker if been cooked together with raw mango…. 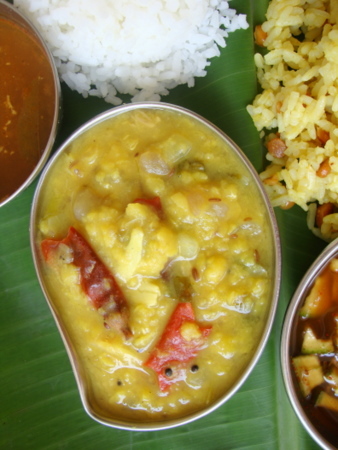 Because of the sourness of mango the dal won’t cook properly…. She says that mango and dal are soppsupp to be cooked separately and then to be mixed…. So which way it’s correct to cook mango dal?? ?